At age 11, Michael Kleiner spent 1969-70 in Norway with his family. During subsequent trips as an adult, Michael’s affection for the country grew; its people became a second family. As an 11-year old, Michael Kleiner spent 1969-70 in Norway with his family, attended a Norwegian school, learned about the culture, the language and enjoyed unique experiences. He would not return to Norway until 1986 as an adult. During that and subsequent trips, Michael’s affection and appreciation for the country, its social system and people grew. The book is unique because it is told through a child’s eyes and memories and an adult’s perspective. The book is written with warmth, sensitivity, humor, caring and insight. Michael discovered the value of multiculturalism, a “second home and family” in Norway – a country that is more than cold weather. 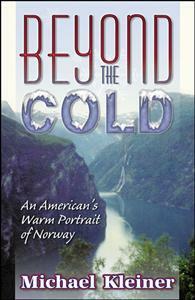 "Beyond the Cold" by Michael Kleiner will enthrall you with its warm insights into Norwegian culture and his introductions to the many friends that he has made during his travels around Norway. Kleiner insightfully describes attractions that you will surely want to visit on your travels to Norway. Or even if you never get to Norway, you will feel as if you’ve been there and have met Kleiner’s friends. From the author’s warm remembrances I learned that wherever your travels may take you, mixing and living with the locals adds a unique value and perspective that you will treasure always. Even though I do not normally read this type of non-fiction, the book held my attention and made we want to read on once I started it. "Beyond the Cold" is well written and tightly edited. I heartily recommend it.